Where Do We Find Christian Community? HomeBlogSpiritualityWhere Do We Find Christian Community? As I consider biblical spirituality, I feel a strong pull to community, a place where significant spiritual connections occur. This should be our experience at church, the reality of church, but it seldom is. The truth is, I don’t know. I’m still searching. That doesn’t mean I never see it, because I do. I sometimes see it after the official church service ends; it can occur in small groups; and it may pop up in service organizations amid the push to achieve a common goal. But none of these are regular enough or reliable enough to provide the spiritual community my soul longs for. I’m more apt to encounter meaningful community when meeting a friend at a coffee shop or hanging out with other like-minded Jesus followers. These experiences give me a sense of the type of Christian community that we can all realize but seldom do. Although church should be the ideal place, she usually falls short, at least as church exists today. The present-day church is an institution. As such it’s good at providing structure but bad at offering true community. This isn’t to imply I’ve given up on the traditional church; I haven’t (yet), but I am discouraged. I write a lot about church, often with a critical tone, not because I’m down on church as much as I hope church will one day rise up and become all she can be, all she should be. In a few hours, I’ll head off for church and later eat lunch with friends. I expect to experience better community afterwards in the restaurant than in the church sanctuary were it should occur. 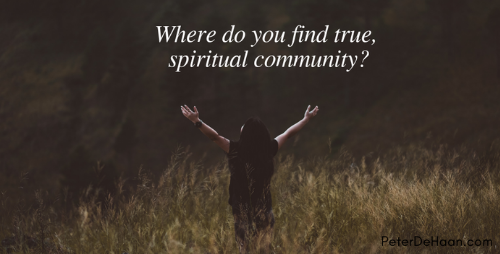 Where do you find true, spiritual community?